If you find an error in the Mansion, then write me please a PM. Attachment removed by Freddy to avoid confusing. 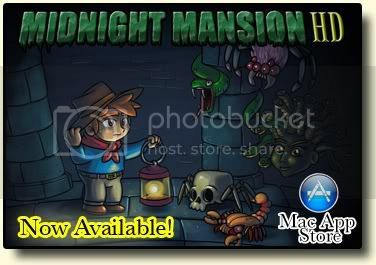 This mansion is now downloadable at the List of Completed Mansions. Hi Mikee! Welcome to the boards. I really liked this mansion! Beat it in 8:03 seconds with all secrets, 3 lives and $7000! Arrived at the winning spot with 0 lives! Sorta reminds me of my older mansions... (Scorpian & Skeleton mansions) Because some parts were nearly the same... but I got those ideas from the inclued mansions, so I suppose you did, too. I like Mikee's Castle...a great start !! I don't think the "grading" of the sections is quite appropriate. The first (EASY) and second (NORMAL) sections seem to be of equal difficulty to me (=pretty easy), whereas the third (HARD) section is at times ridiculously hard. But not in the sense of "hard to explore" but more in the sense of maddening obstacles, that cause frustrating deaths etc. I also have to admit the section with those many gold-switches that keep closing the door time and again (if you don't jump perfectly) are driving me NUTS. Although I eventually mastered those areas, I think the difficulty rises unproportianally as compared to sections 1 + 2 !! Especially as you did not really make EXITS for less experienced players, even if you say so, at the save pedestals. I feel you should maybe add an exit door at each of the save pedestals for players who do not want to try their luck in the hard section. But apart from that, as I said... I liked it a lot !! Can't believe you beat the whole thing that fast !!! Hats off to Wingy...!! Have you played all my mansions? Have you beat Volcanis? How did you like my very very first mansion, Wingy's Small Mansion? P.S. Some of you may think, that Skeleton Mansion was my first. I uploaded it first, but Wingy's Small Mansion was made first. Yeah, I thought so (that WSM was your first one)..... and yes, I have played 'em all...although in Volcanis I always keep wasting my last life at the last gold/silver block jump, which for some reason seems to be harder than all the others. I did like your first mansion a lot. But it isn't an easy one, of course. I should say normal-to-hard. IF, only IF, you should ever have a reason for an update, there are a few things that you can have a look at. 1° In room 16105 the topfloor is easier when NOT pulling the lever and avoiding the floorbutton. 2° Maybe you can do something about the number of secrets? 3° The texts in your rooms at the saving points are confusing. You didn't ask yet, but this mansion certainly deserves a place at the List of Completed Mansions. So I am going to add it AND, to avoid confusing, will remove it at your first post on this board. Jack needs to jump BETWEEN the floorbuttons! There is a trick, you know ... FIRST jump up and only then move to the left. But ... very fast ... very very very fast. Are you sure it is 8:03 SECONDS? The timer after you finish a game is in minutes.